The performer displays two different colored lit candles, for example one red and the other yellow, (actual colors may vary) on two candle stands. 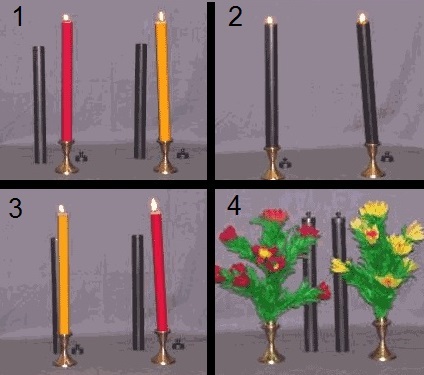 Two narrow tubes are now placed over the candles, (with the flames showing over the top) then lifted, and the candles have magically changed places, with the yellow candle where the red was, and vice versa. 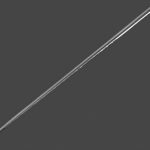 This transposition effect is repeated a couple of times. Finally a cap is placed over the tubes to extinguish the flames. When the tubes are now lifted, the candles have transformed to flower bouquets, with flowers of the matching colors. 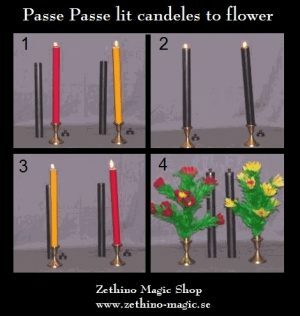 Besides the effect above, you could also use the same apparatus for performing the standard Candle To Flowers effect, where a lit candle covered with a tube changes to bouquet of flowers. 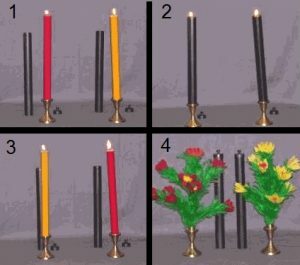 Or you can present a variation of this, where a red candle covered with a tube changes to yellow, then back to red, and finally to a Bouquet of Flowers. You can use any of the presentations above, depending on how long or short you want your routine to play. 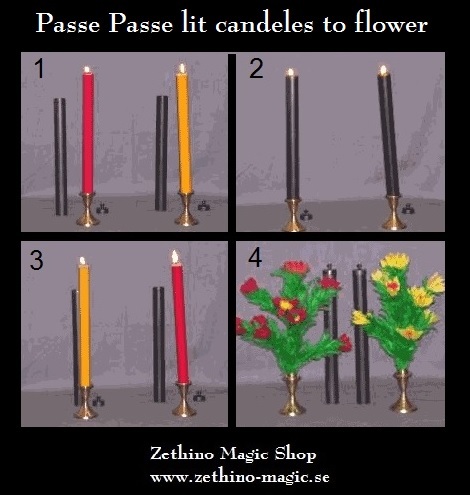 The bare Candle to Flowers effect can be performed in seconds, and the complete Passe Passe effect can run for a few minutes. 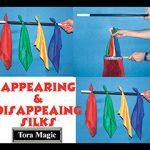 All the props are made from non rusting brass and powder coated to give you a durable and long lasting effect, easy to perform, with an added twist to a classic bit of magic.